I am a big fan of Indian-made pencils. In fact, my beloved Neon Casemates (suspected to be made by Nataraj) are from India. 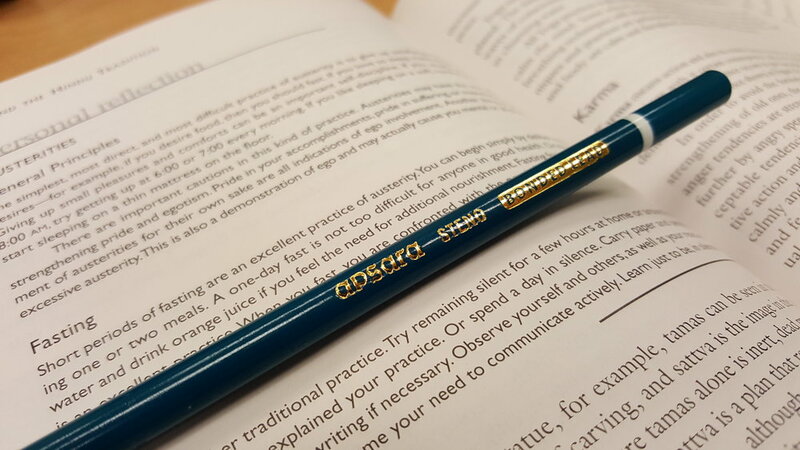 I am in love with the color schemes, graphite performance, and affordable price points when it comes to Indian pencils. When the Apsara Matt Magic pencils popped up on CW Pencils, I just had to have them. The Matt Magics have a black matte finish, are emblazoned with silver foil stamping, and have a color-dipped end that corresponds to the dyed wood of the pencil. What is striking about these pencils is when sharpened, the black barrel provides a perfect contrast against the colored wood. The Matt Magic is advertised as “extra dark” and writes just about as dark as the Apsara Absolute. Point retention is a bit poor, but that is to be expected with such a dark pencil. What really makes these a “must buy” for me is how aesthetically pleasing they are and how smooth they feel when laying graphite to paper. You can pick them up for 75 cents a piece at CW Pencils.